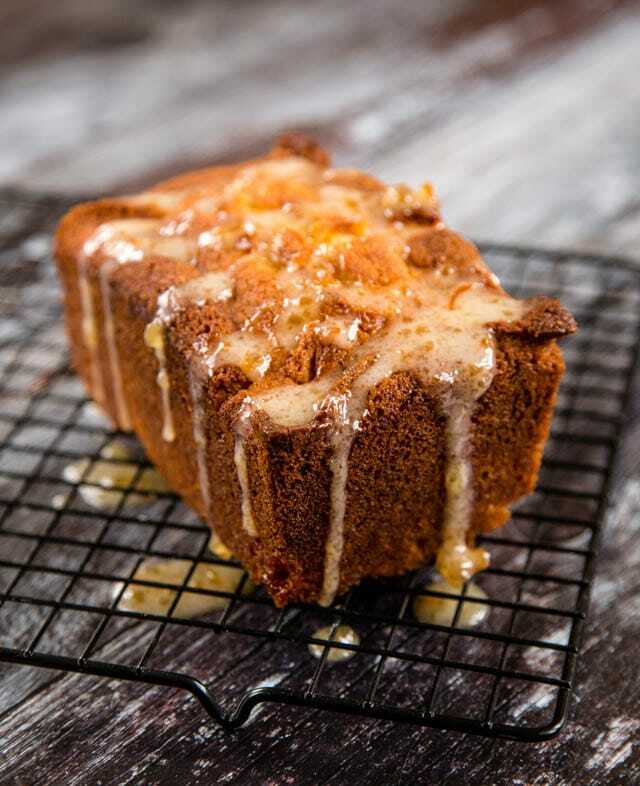 This sticky orange marmalade loaf cake is quick and easy to make, packed with flavour and a real tea time treat! 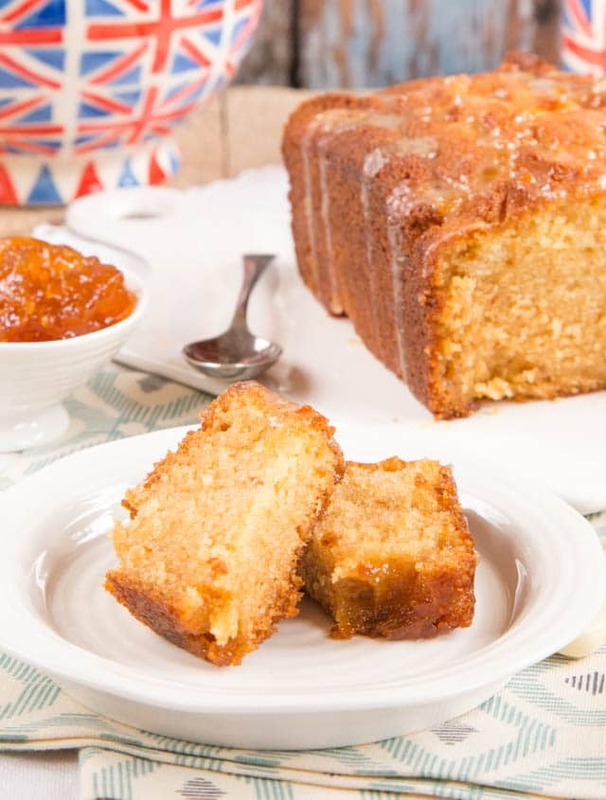 While toast and marmalade for breakfast is an absolutely quintessentially British classic, this cake is a great way of enjoying the bitter flavours at other times of day. 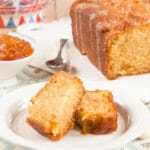 But don’t feel that you can only make this cake with home-made marmalade – a pot of ready-made will work just as well. proper marmalade is so much more than just an orange jam – it is made from bitter Seville oranges; available for a few short weeks at the start of the year in January, which are simmer, the peel shredded then cooked with sugar to make the “jam”. If you make your own it is best to leave it for a year before eating, we are currently enjoying the last of the 2008 vintage! Step one – butter a 1lb/15cm/6″ loaf tin, and line it with baking parchment. Heat the oven to 160°C (fan)/ 320°F/gas mark 4. Step two – beat butter and sugar together until pale and fluffy with an electric whisk. Step three – whisk the eggs into the butter and sugar mixture. Step four – fold in the remaining dry ingredients – the flour, salt and baking powder. Step five – fold in the marmalade and milk. Step six – Transfer the mixture to the loaf tin. Step seven – Bake. Loaf cakes are thicker than those baked in normal cake tins, so will take longer to cook. This one takes about 50 to 55 minutes. Check as normal with a skewer or toothpick. Keep an eye on the cake, and if the top has browned but the cake isn’t fully cooked, then cover it with foil. When developing and testing this recipe we also tried the cake just with orange zest in the batter, and the marmalade only used as the glaze, but the double marmalade is undoubtedly better. This recipe would also be ideal for using up a half jar of crystallized dried out marmalade form the back of the fridge or cupboard. Simply stir in a little water and microwave in 10 second bursts to soften before stirring into the batter. A loaf cake is really all about the flavour, and not the decoration. Don’t spend ages worrying about the looks, and that this cake doesn’t look like an entry for the village fete best decorated cake competition; just enjoy the taste. It’s best to wait a while before pouring the marmalade drizzle on top; the cake wants to be warm enough to absorb the drizzle, but not so hot that it gets all runny and runs off. When you make the drizzle mix the icing sugar and water, then add the marmalade. If you try the other way round you will never get rid of the lumps of icing sugar. This cake can be enjoyed at any time of day; it works really well as a pudding or dessert at the end of a meal, served with cream that’s been whipped with some more marmalade stirred through. Or for a absolutely traditional British moment, having slice at tea-time, with a mug of tea – that has been made in a pot – really hits the mark. Taking a few quite moments with a cup of tea and slice of cake is a great way of relaxing, and taking a moment away from the stresses of everyday life. Love loaf cakes? Then check out my Frozen Yogurt Cakes Two Ways! If you try this Sticky Orange Marmalade Loaf Cake please tag #FussFreeFlavours on Instagram or Twitter. It is amazing for me when for me when you make one of my recipes and I really do love to see them. You can also share it on my Facebook page. Please pin this recipe to Pinterest too! Thanks for reading Fuss Free Flavours! 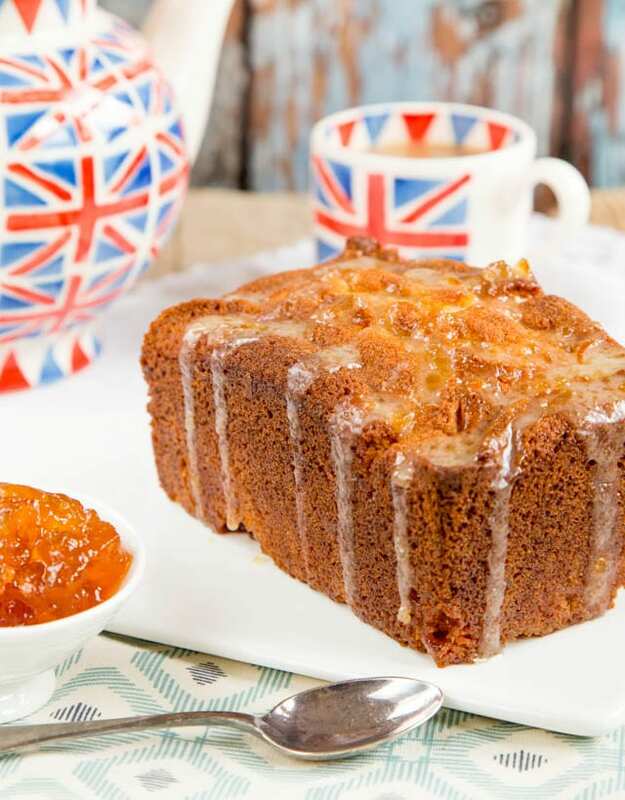 This sticky orange marmalade loaf cake is quick and easy to make, packed with flavour and a real tea time treat. Best made with homemade marmalade, but shop will do as well. Vegetarian. Preheat oven to 160°C (fan)/ 320°F/gas mark 4. Butter a 15cm/6" loaf tin, and line with baking parchment/silicone paper. Beat in the eggs. Mix together the flour, salt and baking powder well in a separate bowl, and add to the butter, sugar and egg mixture. Fold in the flour. Add the marmalade and milk, and fold in as well. Spoon the mixture into the loaf tin and spread. Bake for about 50 – 55 mins until golden brown and firm to the touch, and when a cocktail stick is poked into the cake it comes out clean. Allow to cool for 5 minutes then run a round blade knife round the inside of he tin and turn out onto a wire rack. Sift the icing sugar into a bowl, add the warm water and mix. Stir in the marmalade. Spoon the mix over the cake, letting it run down the sides. Leave to set before cutting. Keep an eye on the cake whilst it is baking and once it is golden brown loosely cover with foil to stop it over browning, for the rest of the cooking time.